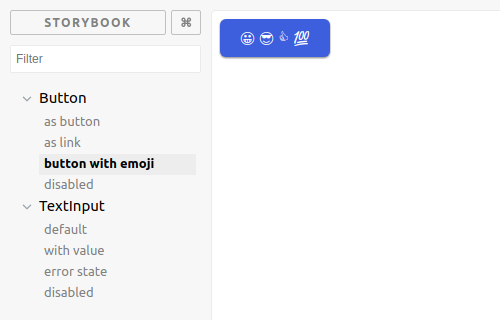 In this tutorial, we will set up a small project with automated visual regression tests using Storybook and VisWiz.io. Storybook is a web based UI development environment for components. With it, you can visualize different states of UI components and develop them interactively. Storybook runs outside of your app. So you can develop UI components in isolation without worrying about app-specific dependencies and requirements. Storybook started as a tool for React components, but the most recent versions have added support for Vue, Angular and Polymer components. For this tutorial, we are going to use React components. If you already have a working setup of Storybook in your project, you can skip this section and follow the next one. Let's start with initializing our project by adding the react and react-dom dependencies. Then we choose to install Storybook using their official CLI, which auto detects what view library your project is using. So, if your project would be using Vue components, for example, the CLI would install the required Storybook dependencies for Vue. In our case, it will use the React dependencies. There is also a more detailed guide on how to set up Storybook manually, for a more customized configuration. To add visual regression testing, we need to capture screenshots of all our components stories in Storybook. We can use the Storybook addon storybook-chrome-screenshots, which runs all the stories inside Puppeteer (headless Chrome) and captures their screenshots. Using this configuration will take a screenshot of all your stories. If you want to choose only a few stories to screenshot, then remove the withScreenshot() decorator from this main configuration file, and add the decorator to the stories you want. DONE  Screenshot image saving is completed! For the final integration of VisWiz.io in our tests, we need to have the following environment variables available when we run the viswiz CLI: VISWIZ_API_KEY and VISWIZ_PROJECT_ID. You can export these to your terminal shell while developing, but you will need to define these in your CI system (please refer to your CI documentation on how to define environment variables). If we want to run the test locally, we'll need to pass more arguments to the viswiz command (like the commit revision, commit message and branch name). If we run this test on popular CI services (e.g., Travis, CodeShip, AppVeyor, etc. ), these values are auto-detected. When we run the tests now on CI, we will send the images results from your tests to our VisWiz.io service for regression testing. By default, the screenshot addon takes screenshots of the stories in a 1024x768 viewport. You can customize the size of the viewport or even choose multiple viewports using the addon's setScreenshotOptions method. This will enable you to test your application in a variety of viewports to validate your components' responsiveness. You can also follow this tutorial with the actual code, commit by commit, on our tutorial repository: github.com/viswiz-io/viswiz-tutorial-storybook. Congratulations! 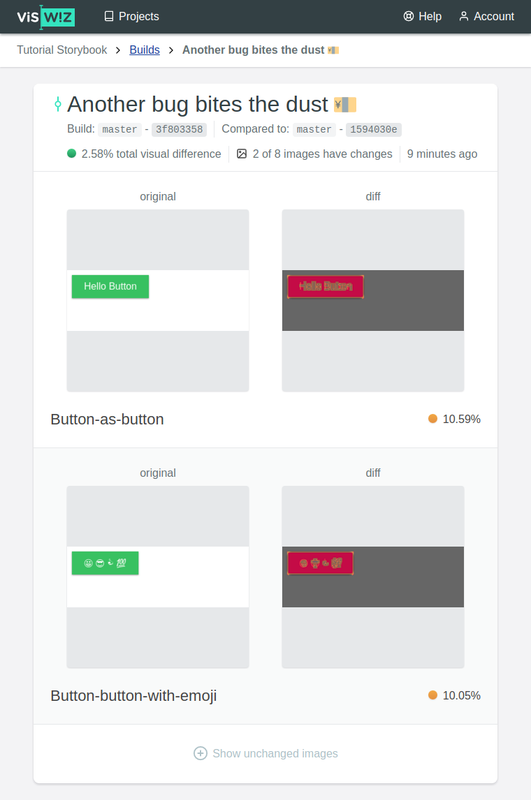 You are now ready to start visually testing your UI components with VisWiz.io!